Club Penguin Cheats by Mimo777 Club Penguin Cheats by Mimo777: Club Penguin Igloo Upgrades Catalog...NOT! Wow, that's disappointing! I expected some sort of new Dojo type iggy, didn't you? 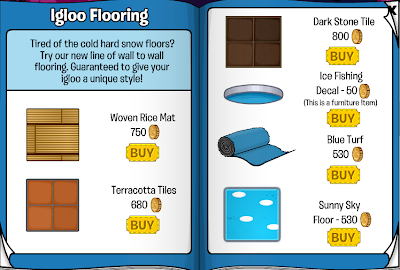 i really exspected some new igloo. and that new floor isnt thatreat.but really? one update?